Raise your hand if you like the convenience of eating out instead of cooking at home! I'm SO thankful when I'm able to grab a meal out and avoid the time on my feet in the kitchen cooking (not to mention dishes and clean up!). Trim Healthy Mama & Eating Out are totally compatible, and I want to share how I do it! My family enjoys eating out from time to time. 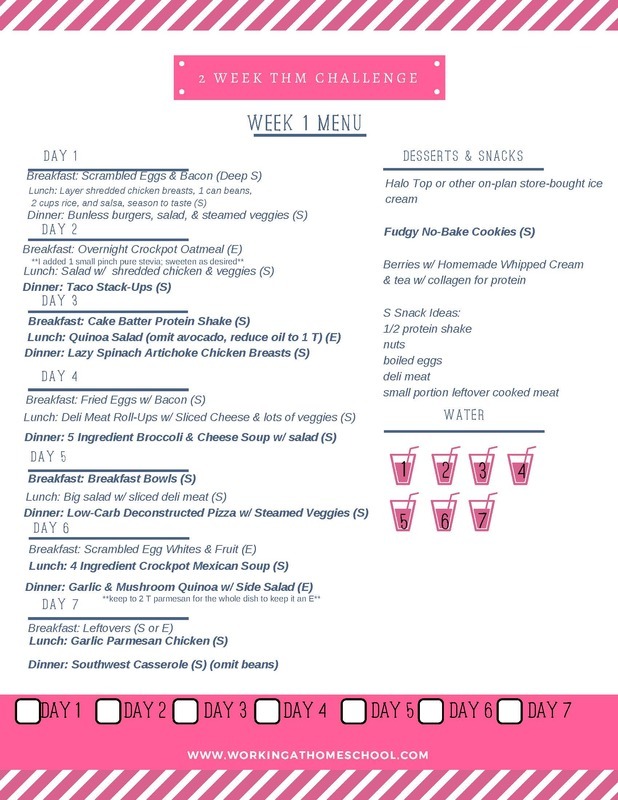 It used to be a twice-weekly habit, but since I've been on Trim Healthy Mama (and also since the budget has made it necessary to eat at home more) we've tapered down and just don't eat out as often. Even so, it seems like there are SO many choices, and it can be hard to know what to get that's on-plan! I've been on-plan for over 5 years, and it took awhile before I felt really great about ordering quickly and on-plan. As a Certified THM Coach, I get a lot of questions about what to order at restaurants or fast food places. I started writing down what I order when I'm eating out, and now I have a full, handy list of things to get that work on the THM plan! I'm sharing all of my favorites here, but I also have a printable version you can take with you or keep on your mobile device – you can get your copy at the bottom of this post! Smoked Italian Porchetta Sandwich with no bread. (S) All are great served over lettuce, and salads are a great option if your location serves them. I avoid burgers with barbecue sauce or onion rings. Just about every burger place (including Five Guys, In-n-Out, etc.) will give you a lettuce-wrapped burger instead of a bun. There is too much fat in the rice, beans, and meat alone to be an E, according to the Chipotle nutritional calculator that I used, but you may enjoy that as a Crossover, as well. Grilled Chicken (FP) – it's not perfect, but it can work in a pinch! The THM books have mentioned making low-fat E sandwiches on wheat bread at Subway as a not-perfect THM meal in the past, but I personally don't enjoy doing that because I've noticed an increase in sugar cravings when I eat those. That could totally be just me, though. Many sub shops, like Jimmy John's will make lettuce-wrapped sandwiches. At Jimmy John's they are called “Unwiches.” You can also order a tub of meat with lettuce at Jersey Mike's. Depending on the ingredients, these would most likely fit into the “S” category if they have cheese or fattier meats. Chinese food is difficult, but not impossible, due to added starches and sugars in the sauces. Brown rice with plain grilled meat or veggies is an option for an E as long as they are not grilled or cooked in butter or oil – if they are, it's a crossover. I can often find Egg Drop Soup with no added starch (S), and some curry. Baked or braised meats and veggies are often on-plan. I like to get popular dishes at most Italian restaurants and hold the pasta. I've also gotten big salads and pulled the toppings from a few slices of pizza to enjoy the cheese and pizza toppings. Some restaurants are starting to serve zucchini noodles, which are a great option! All of these would be “S” options. Skip the tortilla chips and tortillas! Go for big salads with no fried ingredients, burrito fillings without potatoes or tortillas, or tacos without the shells. You could also try bringing your own low-carb tortillas for a healthy S.
Grilled steak or chicken are perfect with side salads or veggies. I skip the potatoes and stick with an “S” meal, and I'm always careful to ask the server not to bring any bread. . At Outback, for example, you can get a steak, a side of steamed veggies, and a side salad in one meal . « October Challenge to Get 100% on Plan!